Will search personalization transform search engines from keyword-driven finders of information to sources of recommendations that attempt to understand and match the intent behind searches? A newly published patent application from Google describes how a combination of different types of Google generated profiles associated with a searcher might influence the results that they see. The description in the patent filing is substantially the same as some I’ve written about in the past involving personalization from Google, in my 2006 post Google Personalization Methods. But I couldn’t help but think of the role that Google Plus might play in personalized search from Google as well, while reading through the patent. 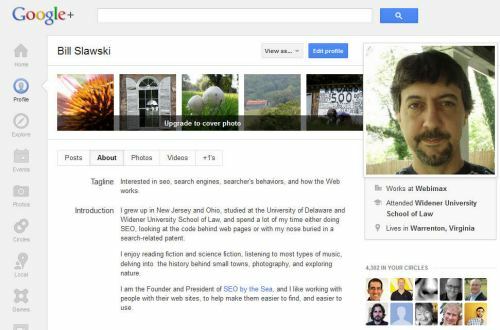 Is information from my Google Plus profile used in personalization? Is other Google Plus information part of personalized search? When you start typing a query into a search box at many search engines, you may see a dropdown appear under the search box which offers selectable suggestions for query terms even before you may have finished typing. The suggestions may also provide alternative URLs for web pages if you are typing the address of a web page into the search box. We’ve seen a few patent filings in the past that describe this kind of behavior, but they haven’t gone into a lot of detail about how those specific suggestions might have been chosen. In November of 2009, Google announced changes to the way people search when logged into their Google Accounts, in an Official Google Blog post titled SearchWiki: make search your own. The changes allowed searchers to move search results up in rankings that they see when searching for specific queries, suggest new pages for searches for queries, leave notes on pages that show up in search results, remove results from search result listings, and see notes on search results that others have left. If you regularly log into Google to search or access Google’s Gmail and you stay logged in to your Google Account while you search and select pages and browse other pages on the Web, chances are that you’ll see search results personalized for you by Google based upon those pages that you’ve selected from search results, pages that you’ve browsed, and pages that you’ve bookmarked. Using Searchwiki means that you can personalize your search results even more, for specific queries, making it easier for you to refind pages that you’ve found before, or include pages in a specific search result that you want to return to on a regular basis. You can also remove pages that you don’t want to see in those search results. A woman says to a man, “It’s cold in here.” The man puts his arms around her and holds her. He could have turned up a thermostat, or brought her a sweater, or asked her if she wanted to go somewhere warmer. But imagine that the man and woman are in a relationship and have had that conversation a number of times in the past, and the intention behind the words was easily understood by both. We can sometimes understand the intent behind certain words even though the words don’t actually match up well with the intentions of the people who voice them, though the intentions behind words can be difficult things to understand. Sometimes nonverbal communication that accompanies words can be helpful in interpreting them, though humans aren’t necessarily that good at reading nonverbal communication either. Sometimes past experience can be informative in understanding what certain words might mean, like the man and woman in my example above. If human beings can grow easily confused about the intentions behind words, how well can a computer understand the intent behind a handful or less words in a query at a search engine? Author Bill SlawskiPosted on 01/16/2009 07/16/2011 Categories Search Personalization28 Comments on Would You Give A Search Engine a 3D Model of Your Body?